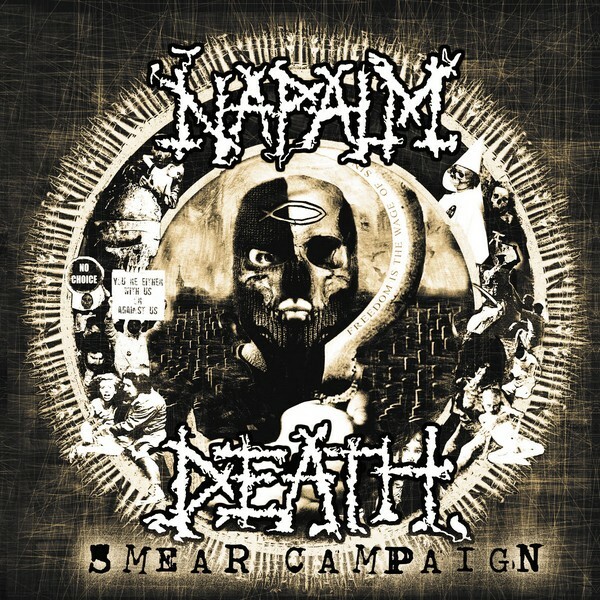 Smear Campaign is the twelfth studio album by British grindcore pioneers Napalm Death. While many of their albums from the 1990s to the first half of the 2000s walk the line between death metal and grindcore, the punkish approach to song-writing pushes Smear Campaign further towards the grindcore camp this time around. Despite the overtly chaotic nature of Smear Campaign, the music is relatively straightforward with the raw intensity coming from the self-described blast beat terrorism drumming of Danny Herrera and the combined guttural performances of lead vocalist Mark “Barney” Greenway and bassist/backing vocalist Shane Embury while Mitch Harris provides feral high pitched shrieks for contrast. For this reason alone the lyrics are largely undecipherable without having a written copy in front of you for reference. In some ways this is quite a shame because Napalm Death brings a much needed intellectual counter balance to extreme music lyrics which offset the staple diet of guts, gore and cartoonish bellyaching about the woes of the world. Instead they deliver sharp and direct criticism of religion and society, the main themes of Smear Campaign, without the tired and overused approach of most other bands that tackle the subject. Early on the band addresses the philosophical concept of fatalism, on the song Fatalist no less, to proclaim that “existing becomes a prison where self-discovery’s forbidden”. Since Fatalism is the belief that all actions are predetermined (fated to happen) then there’s no control or changing of any unfolding events. It is then concluded at the end of the song that “any fool starting afresh would surely ditch this/after two-thousand years of schism/only irreligious hearts can do the saving” so as to offer a solution in saying that a new, non-religious train of thought must take hold within society to make progress for the betterment of everyone instead of clinging on to ideologies that were developed thousands of years ago and don’t necessarily apply to modern life. The theme of societal progress and anti-religion is reinforced with the chorus to When All is Said and Done, which proclaims that “when all is said and done/heaven lies in my heart/no slave to beliefs that propagate pain/when all is said and done/heaven lies in our hearts/this life is a gift to be lived and loved” to reject ideologies that harm people and strip away the value of life itself. Along with the critical lyrics comes an added sense of melody and experimentation in some instances because, after all, there is only so far you can push outright aggression before you repeat yourself or begin to stagnate. Some notable moments include the industrial influenced introductory song, Weltschmerz, which includes a wordless vocal contribution from Anneke van Giersbergen (The Gathering), who also performs the monotonous spoken word piece on In Deference. On paper this comes across as an odd pairing but it is probably the only way that her voice could fit into this kind of music and the end results are effective in blending her voice to the cacophony around her without coming across as forced experiment for the sake of it. Smear Campaign closes with a 3 part mini-epic that will easily catch many fans off guard. Persona Non Grata is the first part and sees Napalm Death using measured aggression to play off against slower moments with growled vocals performed in a melodic fashion that will make you think that the band are about to burst into clean singing at any second. Sludge metal is then embraced for the miniature title track along with the more melodic singing style that turns into a sort of echo-laden chant before fading out and concluding the album on the standard edition. On the limited edition this then leads into the second bonus track and third part of the mini-epic, Atheist Runt, which is the slowest and longest song on the album at nearly 7 minutes long. This will prove to be quite a test for some fans due to the slow nature of it and yet it is by far one of the most rewarding moments of the whole album if you appreciate the bands decision to branch out and do something a bit different. Underneath what will sound like the utter chaos of a battlefield to most people, Napalm Death have artfully fused thoughtful lyrical content and a bold experimental edge into their frantic grindcore blueprint to prove that they are as innovative on Smear Campaign as they were at their inception.